During our 2010 summer residency at Artscape, Gibraltar Point Centre for the Arts on Toronto Island our labyrinth workings included an Ocean Day Labyrinth Making and Walking as a healing action for the Gulf of Mexico, an invocation of gaia's womb wisdom for the G20 summit, video entitled M/Other Ways, and a cosmic birthing ritual and menstrual blood offering. 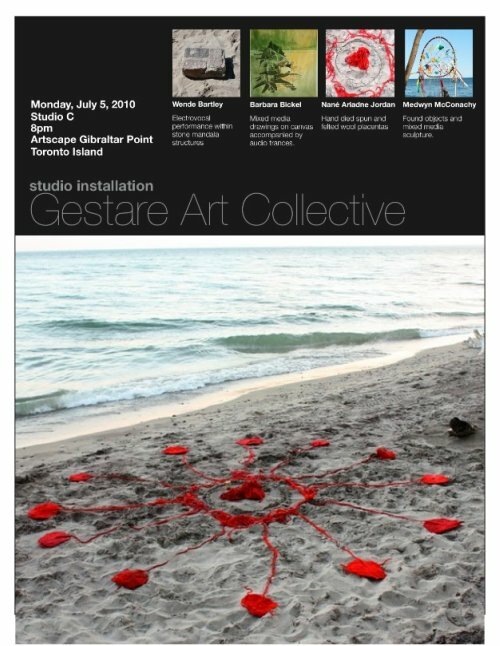 During summer residencies at Artscape Centre for the Arts, Toronto Island, Ontario, Canada, Gestare members have gathered for periods from one to five weeks, to collaborate, co-create and gestate their art together. A studio installation at Artscape honoured and celebrated individual and collective artworkings, thus completing the circle for the 2010 Gestare residency. the harp’s healing reaches me. I’m glad I’ve left my door open. the colour of candied ginger. I am well in the world. the soft rush of water. that our fire burns with good intention. The evening studio gathering and astrology readings for the venus pentacle. The camera captured this energy in the room that night. While at the residency we had the opportunity to do a labyrinth walk and sounding with Celtic Harpist Patricia Sereno on the beach. We were fortunate to have photographer Judith Lermer Crawley document the event. Click onto Judith's website www.JudithCrawley.ca to see the full collection of photos.